Some artists play country music by numbers and follow the text book without exposing any soul. Others play it instinctively and it’s solidly embedded in their DNA. 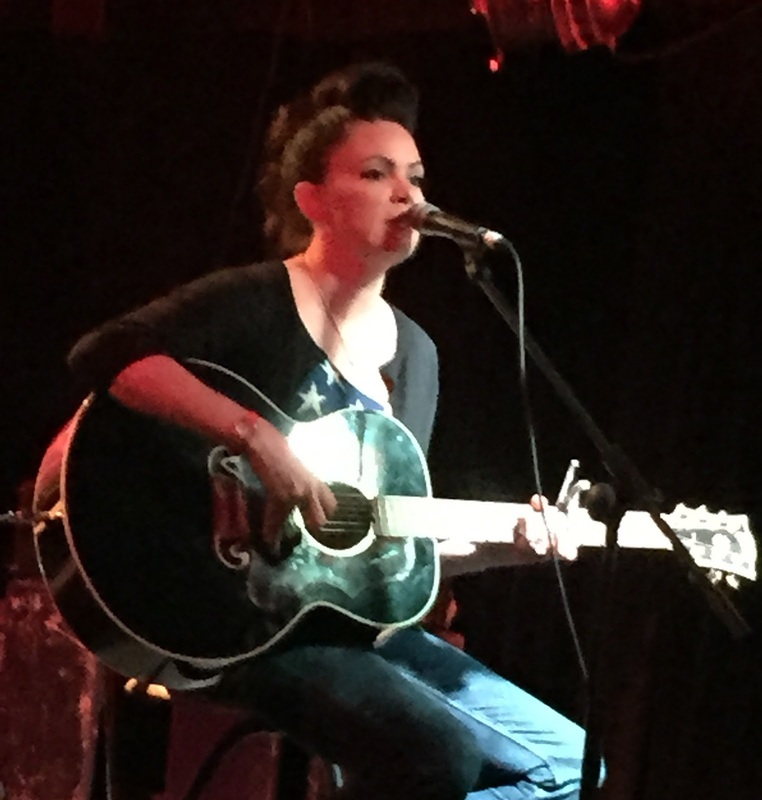 Angaleena Presley is definitely in the latter camp and exudes every ounce of her Kentucky coal mining upbringing in her craft. In a career which has had a steep upwards trajectory in recent times, Angaleena has finally taken the bold step to meet her growing overseas fan base on their own turf, or to be more accurate undertake a short UK tour. The Night and Day Café, in Manchester’s cultural Northern Quarter, hosted the second date on this visit and a well populated gathering in this slightly elongated-designed venue saw close at hand a finely tuned songwriter sharing her wares in a relaxed intimate setting. For many years Angaleena pitched her songs like many Nashville based aspiring songwriter before experiencing a career launching break as part of the popular country female collaborative project the Pistol Annies. 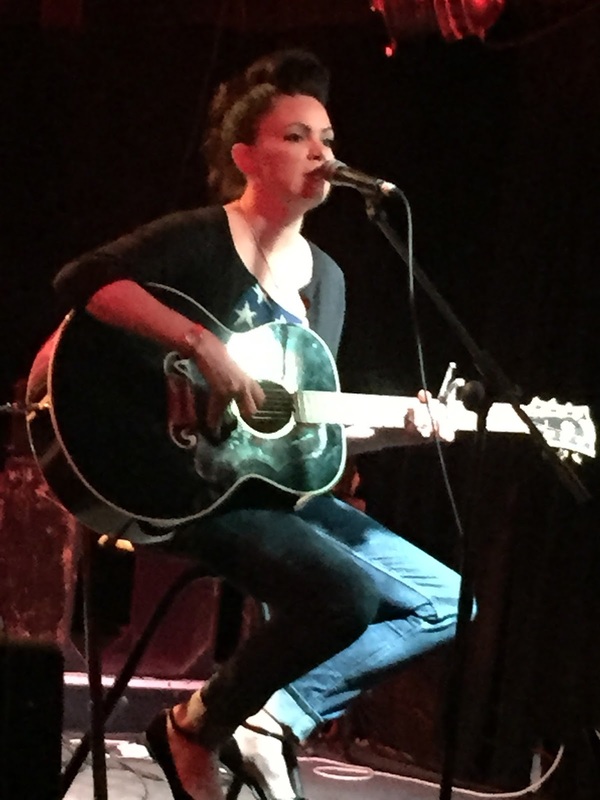 Eventually the long awaited debut Angaleena Presley solo record finally surfaced in 2014 to widespread acclaim and AMERICAN MIDDLE CLASS was rich in a substance of what every great country record needs. This tour was enabled on the back of the success of that album which benefited hugely from its independent origins and distribution through the Thirty Tigers network. Not surprisingly, a fair proportion of this record filtered through to the set list as Angaleena grasped the opportunity to bring many of the songs to context and given a sense of reality. Although Angaleena had arranged a band backing for her higher profile gigs in London and at the Cambridge Folk Festival, this date took the setting of a seated solo performer with the intent to create some of the intimacy of the famed singer-songwriter circles in Nashville. Along with songs from the new album, a couple of Pistol Annies’ numbers were covered in ‘The Hunter’s Wife’ and ‘Lemon Drop’, as well as a Miranda Lambert recorded song which she co-wrote with her dear friend, ‘Fastest Girl in Town’. With perhaps an eye to the future, there were several songs featured that are devoid of a recorded status at the moment and Angaleena indicated that she would be trying out some new material during the evening. Further information was a little scarce on these, but their initial entertainment value was high and in the true mould of Angaleena’s song writing style. This facet of her trade was in abundance in the songs selected from the album with the intrinsic link between ‘Knocked Up’ and ‘Drunk’ referenced to her ex-husband. A personal favourite from the album ‘Dry County Blues’ possessed all the grit and dark undercurrent in its live performance as has been devoured on many listens. ‘Better Off Red’ saw Angaleena a little misty eyed, while ‘Pain Pills’ extracted a deeper sense of emotion and was a major highlight of her eighty minute stage time. First and foremost, Angaleena is a songwriter and occasional lapses in lyrical and chord rendition were forgiven by a smitten audience. When in full vocal stride, she packed a powerful punch to add extra impact to the substantial songs and perhaps needs a few more UK shows to settle into the groove of delivering an all-round polished and informative performance. Her affable and soulful traits are exceptional as well as an innate ability to reach across the spectrum of American roots music, connecting with those ingrained in mainstream country music and others from a left field Americana stance. British duo Luke and Mel opened this show for Angaleena and delivered a thirty minute set of covers and originals which were in a similar vein to the new breed of home grown performers inspired by the modern output from Music City. This style is proving popular in certain quarters and there was plenty of love showed to the duo from many in attendance. However this lengthy midweek journey on a wet and miserable British summer’s day was primarily to see the songs from one of last year’s stand out album releases brought to life and Angaleena duly delivered this as only one could from the memorable hometown of Beauty, Kentucky. Whether in the unlikely circumstance of a major label calling or the more likely scenario of tapping into the bottomless pit of her free and independent spirit, Angaleena Presley has an enormous future in the industry and can evolve as an established performer this side of the pond if she continues to keep us on her horizon.